Our eighth annual countdown started Monday, December 3. Over a 40-day period, we unveil our top prospects in the St. Louis Cardinals minor league system for 2013. Once again, it is time for the unveiling of our annual The Cardinal Nation/Scout.com Top 40 Prospect List, back for its eighth year. During the period we call “40 Days, 40 Nights, 40 Cardinals Prospects”, a new top St. Louis Cardinals prospect is disclosed each day, starting with number 40 and carrying us well into the New Year. Will #1 from the past two years repeat? 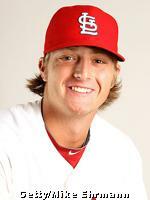 We will continue until the #1 pick is identified – our consensus top prospect in the St. Louis Cardinals minor league system coming into the 2013 season. Will 2011-2012 top prospect Shelby Miller make it a three-peat or will there be a new top dog? As always, following the top 40 countdown will be our annual nine-pack of “best-of”, “just-missed” and in-depth analysis articles to conclude this series. As has been the process in recent years, the final ranking representing the site is actually a melding of three independent lists. The voters are again “CariocaCardinal,” author of our popular monthly top prospect rankings in-season, site publisher and editor Brian Walton, and you, our readers. Since mid-September, the members of our free message board community have been conducting voting for their own Cardinals prospect list. This detailed annual ranking involves considerable debate and discussion. The fan voting process has been imitated but never duplicated, as our readers are the some of the most knowledgeable folks around when it comes to the players in the Cardinals minor league system. The Cardinal Nation community ranking is given equal weighting to the other two lists with the average of the three yielding the countdown order unveiled here. Two community leaders, “BobReed” and “Gagliano”, will speak for the community in the individual player capsules posted daily. To follow the countdown, TCN/Scout.com subscribers can either read each new story when posted on our home page every morning or click on the individual players’ names which will be listed below. All readers, subscribers or not, are encouraged to return to this page daily to check the current status of our Top 40 countdown and read the subset of articles which will be made free to all. Not yet a subscriber to The Cardinal Nation? Join today for as little as $7.95 per month after our seven-day free trial. As always, all readers can join in the debate at our free message board, where there will be a new discussion thread each day devoted to that day’s entry onto the top prospect list. To refer to the corresponding rankings from each of the past seven winters, either click on the highlighted years here: 2006, 2007, 2008, 2009, 2010, 2011, 2012, or you can always use the permanent links on the lower left side of our home page. At the conclusion of the countdown, we will follow with an nine-part series in which we analyze each voter’s individual top 40 lists, year-to-year changes and the top additions. The three voters highlight their ranked players that did not make the combined top 40 and we unveil our All-Prospect Team - the highest-ranked players at each position. We will take a view behind the numbers, a look back at our best and worst picks from the previous year and wrap it up with the top prospect list cut by level of play. Here is a bit of insight into the process. During November, CariocaCardinal and Brian Walton independently documented their top prospects in the Cardinals minor league system. The Community ranking was then folded in. A consensus score was tabulated, which drove the ranking you will see here. The three individual scores will also be shown on the player pages as they are unveiled each day, along with a wealth of additional information on each of the 40 prospects. Players must have been named on at least two ballots to be considered and to ensure we could agree on 40 names, each of us submitted lists of 46 players. This year, 55 prospects were identified on at least one list and 46 were named on at least two ballots, meaning some good players just missed the cut. Ties were broken by the most individual votes received, then best single voter score. In terms of qualification, all players in the Cardinals minor league system are eligible, including those on the 40-man roster, as long as they have not exhausted their MLB rookie designation. Because each voter used slightly different criteria in defining what a “top prospect” means to them, all briefly explain how they made their selections. My top 40 ranking is based on a balance of results and potential gleaned from statistics and on-line scouting reports. Strong weighting is given to first-hand accounts. I feel I had a built-in advantage in the process as I had been preparing a monthly top 40 Cardinals prospect list throughout the season. That included sharing my thought process on each pick and in some cases, debating them with readers. For this effort, I began with my end of season top 40 as the base. The primary difference between my November ranking and the end of season top 40 list is injury impact. I gave injuries lesser significance here. The top 10 or 12 Cardinals prospects are fairly consistent across most prospect raters. The real work is in identifying the next tier - solid contributors and quality players today on the cusp of breaking out. Tools can really come into play here. Targeting emerging players is my most anticipated and ongoing challenge. At the same time, we should not give up too soon on talented prospects whose careers may have hit a bit of unexpected turbulence. In the process of ranking, we sometimes put too much weight on current results while missing out on signals of greater potential ahead. Before a strong statistical base as a professional is established, some credence is given to draft position, but clinging to that hope too long can lead to disappointment. This is never an exact process, as we all have hits and misses. Still, I took pleasure in reading others heralding the 2011 “emergence” of Oscar Taveras. While some were still unfamiliar with “minor league guy” in the spring of 2012, he was number five right here on my personal list two years ago. No one has perfect vision. Consensus system-wide 2011 Player of the Year Matt Adams was just 27th in my rankings at this point two winters ago. My initial contenders for the 2013 top 40 included 65 names. They were ordered based on personal observation as much as possible. I was out to see almost all the affiliates in person this spring, summer and/or fall, and in many cases, multiple times. I also received valuable input from coaches, scouts and others in and out of the organization. This is a very straight-forward process. On our free message board, all comers were welcome to cast their vote for any eligible player, with all votes equal. The process began with the number one prospect and continued through 50. Voting closed on a particular spot in the rankings when enough time had elapsed to exhaust responses or a candidate established a large lead. The winner was recorded and the voting began anew on the next number in the list. Discussion and debate is welcomed and anyone could participate. As the result of some convincing arguments presented, personal votes were affected and in some cases changed, indicating a healthy give-and-take among the readers. Not yet a subscriber to The Cardinal Nation? Join today for as little as $7.95 after our seven-day free trial and be able to read all our Top 40 articles and much more exclusive content. 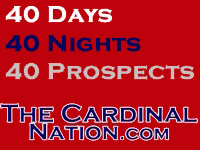 Want access to further details behind our Cardinals prospect rankings in our “40 Days, 40 Nights, 40 Prospects” feature here at The Cardinal Nation? Subscribe by mid-January to our Annual Pass and receive the 2013 FOX Sports NEXT Prospects Guide, a $4.95 value, for free. The perfect hardcopy, glossy companion to “40 Days”, includes the top prospects from all 30 MLB organizations will appear on newsstands all over the country in the spring. Of course, we author the Cardinals section of the guide as always. © 2013 The Cardinal Nation, thecardinalnation.com and stlcardinals.scout.com. All rights reserved. This material may not be published, broadcast, rewritten or redistributed. Don't miss any news or features from TheCardinalNation.com. Subscribe to our newsletter to have our newest articles emailed to you on a daily or weekly basis. Click here for a list of all Team Newsletters. Get free email alerts with news about your favorite topics. Click link to add to My HotList. Copyright © Scout.com. All rights reserved. This website is an unofficial independent source of news and information, and is not affiliated with any school, team, or league. Copyright © TheCardinalNation.com and Scout.com. All rights reserved. This website is an unofficial independent source of news and information, and is not affiliated with any school, team, or league.